It was a visit and experience that left a lasting impression on the staff and patients of Roswell Park Cancer Institute (@RoswellPark) in Buffalo. 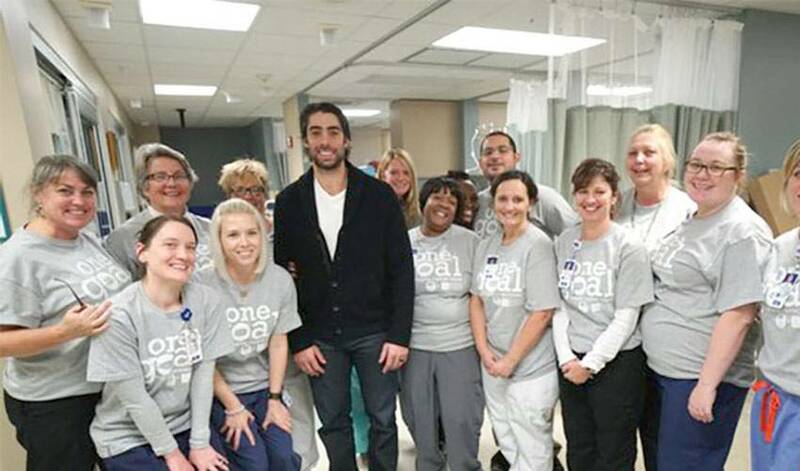 Matt Moulson knows how to bring a smile to people’s faces, even those who are dealing with serious health issues. The effect he had on those he interacted with during his time at Roswell Park on October 20 certainly didn’t go unnoticed. “He listened to patients' stories about their cancer journeys and about their hockey experiences and enjoyment of the game,” said Dr. Johnson. “He signed autographs and posed for lots of pictures, and he gave patients tickets to be the Sabres' guests and enjoy Saturday’s game (against New Jersey), a celebration of the NHL’s Hockey Fights Cancer campaign, with their families. Moulson, like many of his fellow players, continually show their commitment to causes in a variety of ways, including hospital visits throughout the hockey season in their respective NHL cities. For places like Roswell Park, the players’ genuine desire to make a difference is truly inspiring. It’s a familiar scene for Dr. Johnson and those at Roswell. Whether it’s on the ice – he scored the shootout winner against Toronto on October 21 – or off it, Moulson is making an impact.